Boasting uninterrupted, extensive sea views over the countryside, this tasteful barn conversion is positioned in the small village of Gunwalloe. Just a hundred metres away from the award winning Halzephron Inn and less than two miles from beautiful Church Cove beach. Join the coastal footpath from Fishing Cove, an all year round dog friendly beach, within just a five minute walk which heads off towards The Lizard or in the other direction towards Porthleven. The property offers comfortable reverse-style accommodation, with the sitting room on the first floor to take advantage of the spectacular views of sea and coastline. The light and attractive kitchen/dining room on the ground floor beckons onto an enclosed south-west facing garden with patio. Church Cove is an area of outstanding natural beauty; the beach has a tiny church and bell tower which sits below the cliffs. Sheltered and sandy, it is patrolled by lifeguards and popular with families who like to swim and surf. Walkers will enjoy the rugged coastline following the footpaths to Goonhilly and Helford. The path to Halzephron Cove at the end of Porthleven beach is to the north and Poldhu Cove is to the south. Mullion Golf Club sits on the cliff tops and commands stunning views across Mounts Bay. 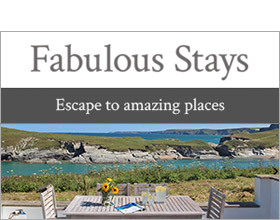 Discover the stunning beach at Kynance Cove or visit Praa Sands, where surf gear can be hired or lessons booked, or within a half hours drive of Gunwalloe, visit the magical jewel in Cornwall's crown, St Michael's Mount with fortress atop, adjacent to Marazion. Venture across by ferry at high waters to the tiny harbour with cottages nestled alongside, with shops and eateries, or walk the narrow cobbled causeway at low tide and be entertained by the water borne activity of dinghies and wind-surfers. Just six miles from the historic market town of Helston, famed for its annual Flora Dance in May. The charismatic maritime town of Falmouth is a 30 minute drive away and offers attractions for all ages; family friendly beaches for sunbathing, rock-pooling and sailing, historic castles, parks, galleries and museums to explore, and ice-creams, fish and chips and a plethora of restaurants to tickle the taste-buds.